Solo w/ Pat Benatar & Neil Giraldo, Don Felder, Mick Fleetwood, Dave Grohl, Vic Johnson, Sarah McLachlan, Steve Vai, Bob Weir. Sammy Hagar and James Hetfield today announced the line-up for "Acoustic-4-A-Cure IV," on May 15 at The Fillmore in San Francisco. Artists performing at Acoustic-4-A-Cure IV include (in alphabetical order): Pat Benatar & Neil Giraldo, Don Felder, Mick Fleetwood, Dave Grohl, Sammy Hagar, Vic Johnson, Sarah McLachlan, Steve Vai and Bob Weir. The 2017 concert blends veterans and newcomers to the event, with Dave Grohl sitting in for James Hetfield, who will be away on tour. 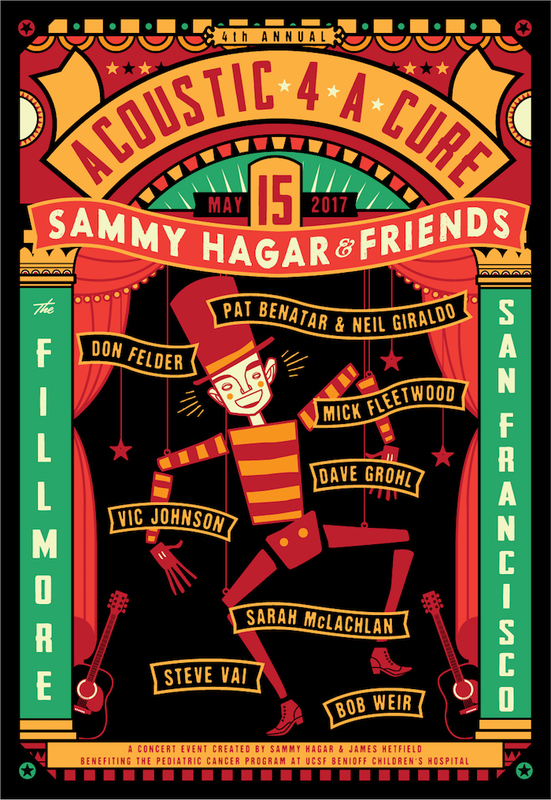 Now in its fourth year, Acoustic-4-A-Cure has quickly become one of the year's hottest tickets, with legendary artists performing acoustic sets, epic collaborations and impromptu jams from the stages of intimate and storied San Francisco venues like The Fillmore. 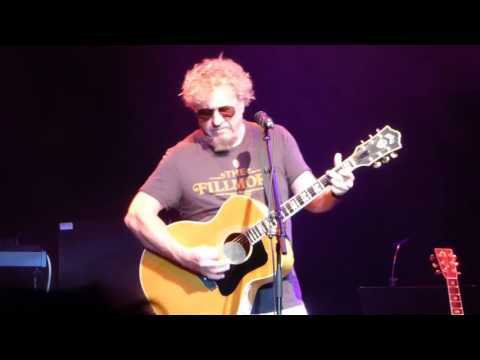 The benefit was created by Bay Area rock legends Sammy Hagar and James Hetfield, whose vision was to raise needed funds and awareness for the pediatric cancer research by throwing a must-see concert for fans and donating all of the proceeds to UCSF Benioff Children's Hospital. In past years, artists including John Mayer, Billie Joe Armstrong, Jerry Cantrell, Melissa Ethridge, Joe Satriani, Pat Monahan, Adam Sandler, Nancy Wilson, Linda Perry, Chad Smith, Vic Johnson, Tommy Lee and Kris Kristoferson have joined Hagar and Hetfield to rock the sold-out benefit concerts. These acoustic shows are my favorite concerts of the year for the past 4 years. This year was no different. I hope this song comes out soon. It is a MUST HAVE. This is gonna be one helluva show. FYI... I'm attempting to get some interviews lined up. Stay tuned to Twitter @TreehouseRocks and FB TreehouseRocks. So happy I got my ticket in the "INSTANT SELLOUT (THE QUICKEST IN A4AC HISTORY)" according to the website! All of my local friends decided to skip this year due to the absence of Pat Monahan. Silly people! ;-) So, of course, now I have a friend who changed her mind and is looking for a ticket. If anyone ends up with an extra, please let me know. Thanks! I'm getting older and slower and Fatter. Just got our tix! This will be our 4th show! Such a blessing to have been at all these charity shows! Looking forward to another epic night for an amazing cause!! !